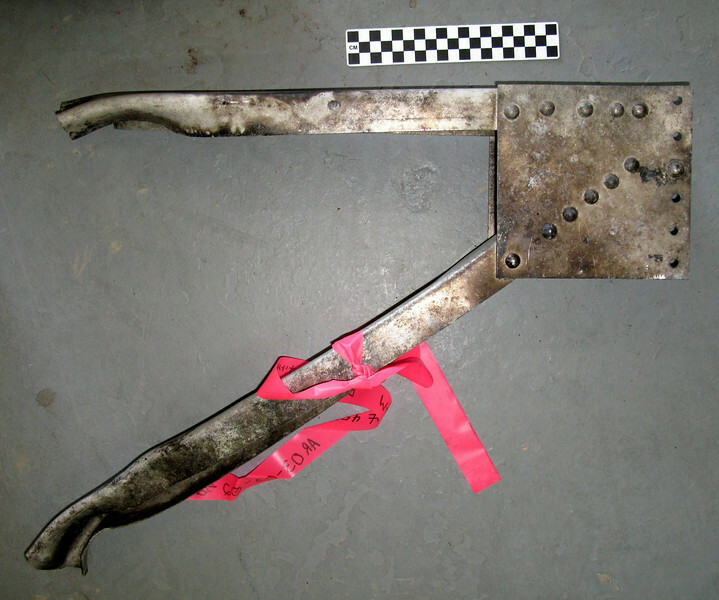 The use of a metal detector helped locate this partially buried fuselage stringer support. Further examination of the stringer support revealed a part number marked in black ink that was barely visible. 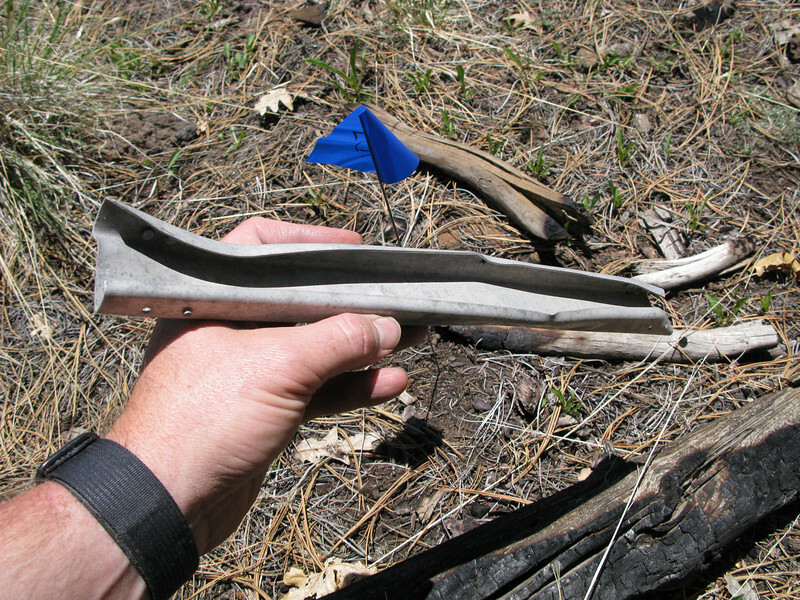 This support and steel cable was used to structurally support the horizontal stabilizer to the aft fuselage. 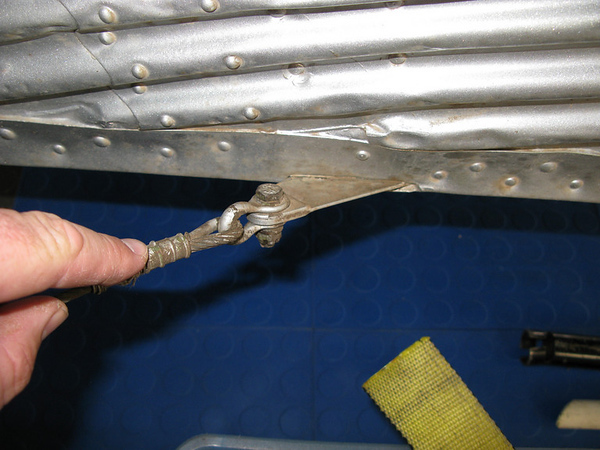 A similiar cable attach point can be found on Ford Tri-Motor (N414H) supporting the horizontal stabilizer assembly. 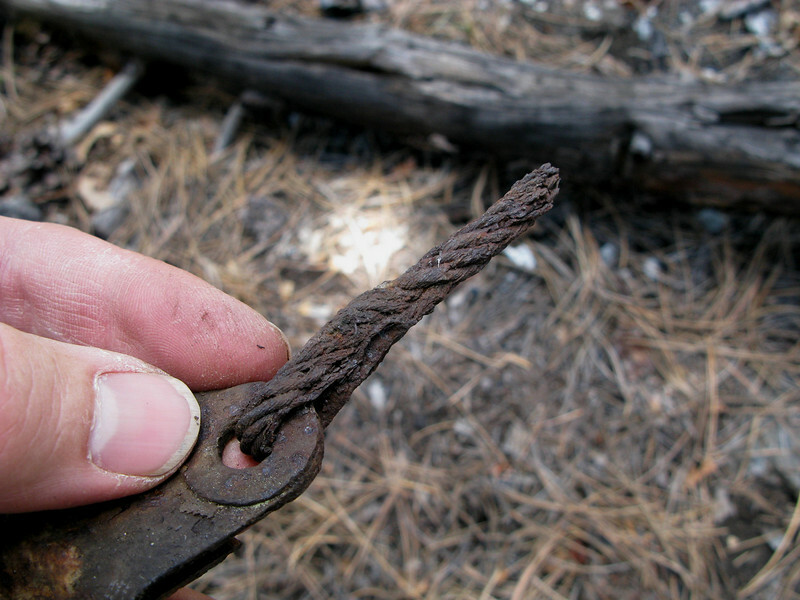 The remaining steel support cable has long been reduced to rust. 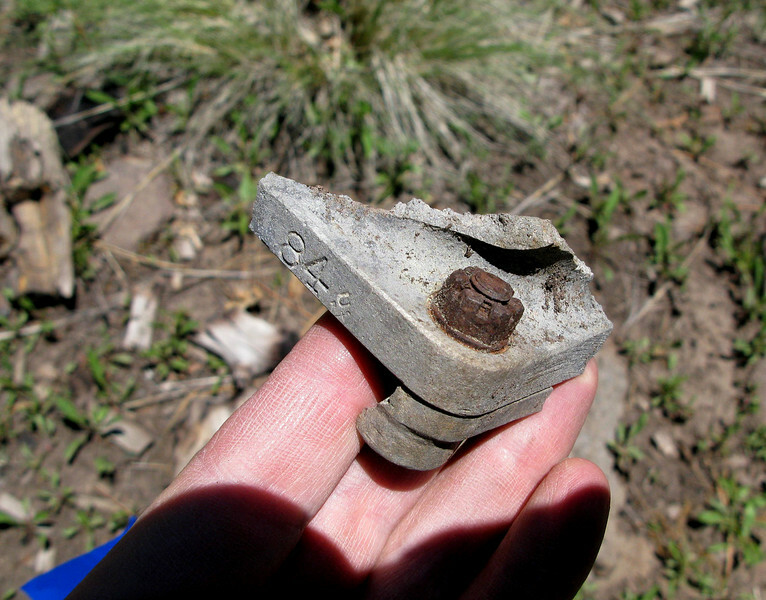 Fragments of fuselage window channeling was located throughout the site. Very little of the Ford Tri-Motor's distinctive corrugated structure remained at the site. Most of it was sadly hauled off long ago by souvenir hunters. 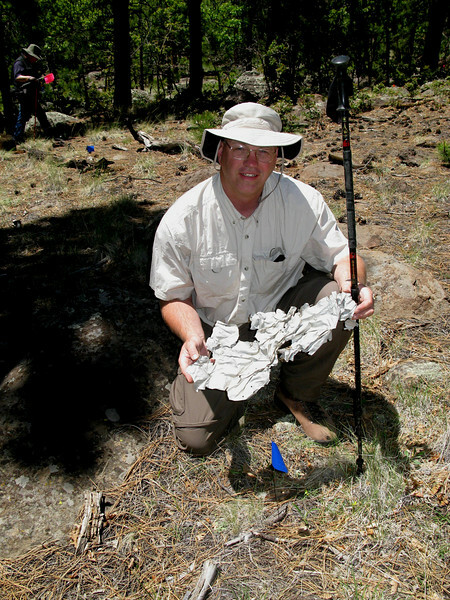 In this photo I am holding up one of the few remaining fragments. Not really sure what this object is. We found several of them. They seem to be too small to support seat frames, so maybe they were used to support window curtain rods in the passenger cabin. 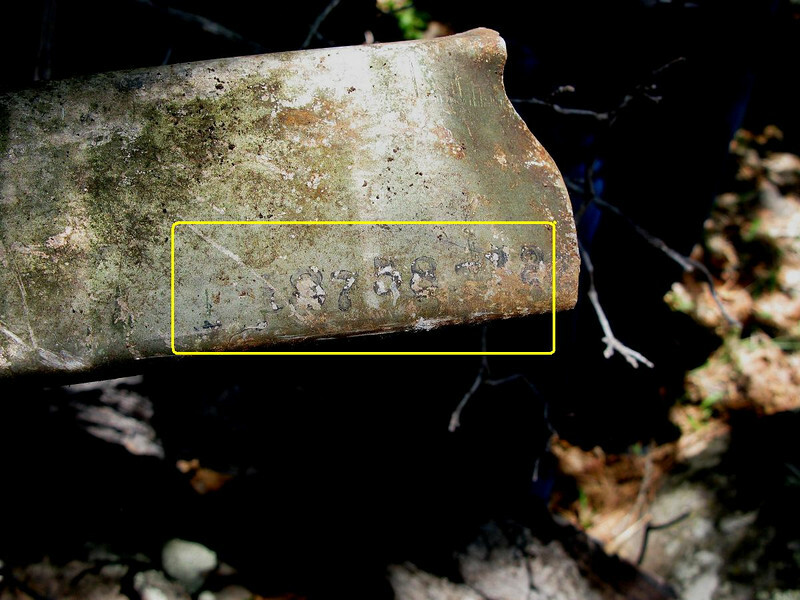 A engine case fragment with stamped number. 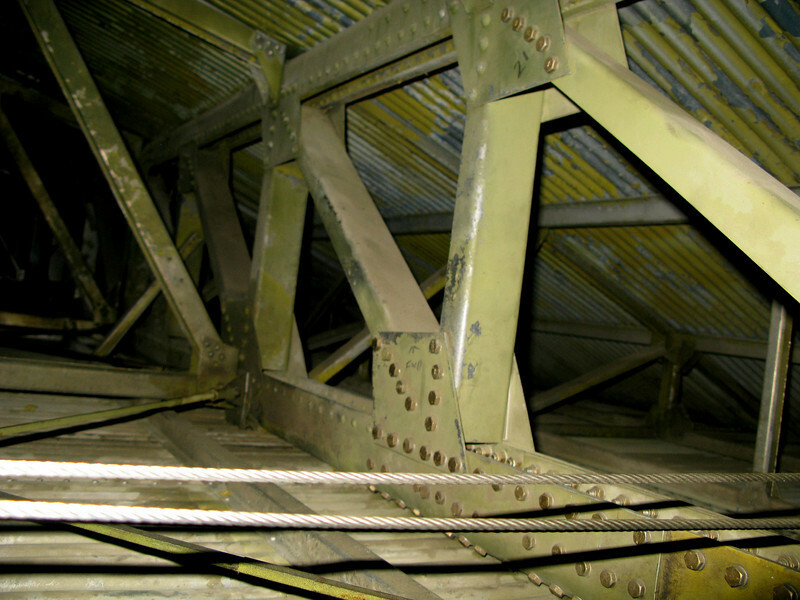 These bolted metal tubes were used to help support the two rear pylon engine cowls. We located quite a few of them during the survey. Another engine cowl panel support tube. 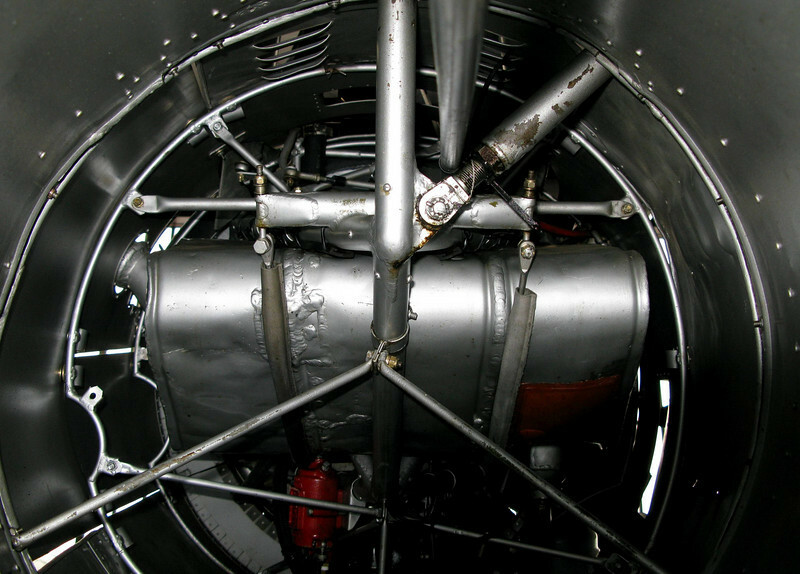 A view inside one of the outer engine nacelles of Ford TriMotor (N414H) provides a look at how the engine cowl supports were used. A light assembly with socket and bulb fragment most likely came from the cockpit of the Tri-Motor. 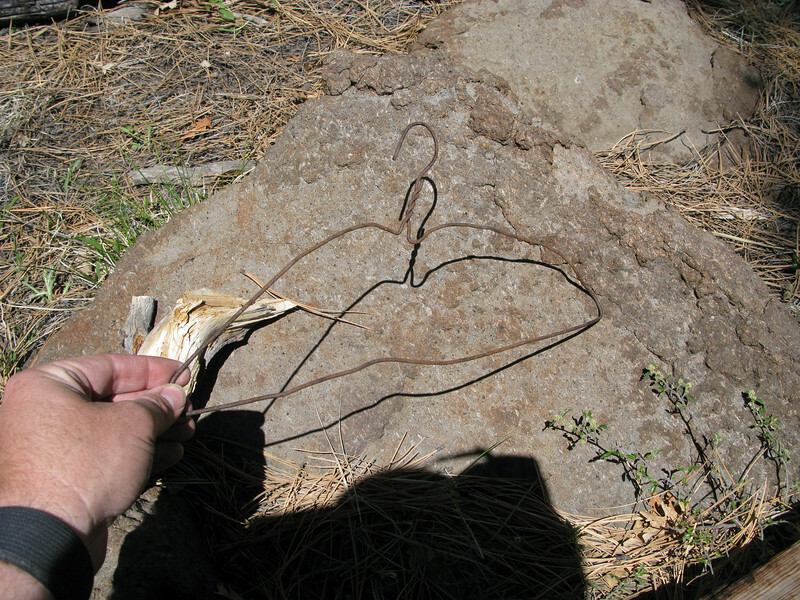 A passenger coat hanger still retains it's shape since the accident. 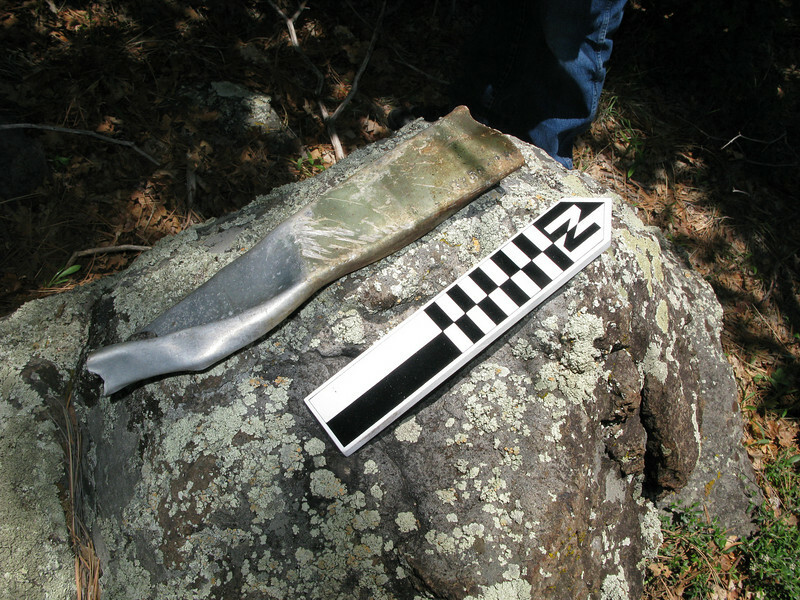 Recording and documenting surface finds. 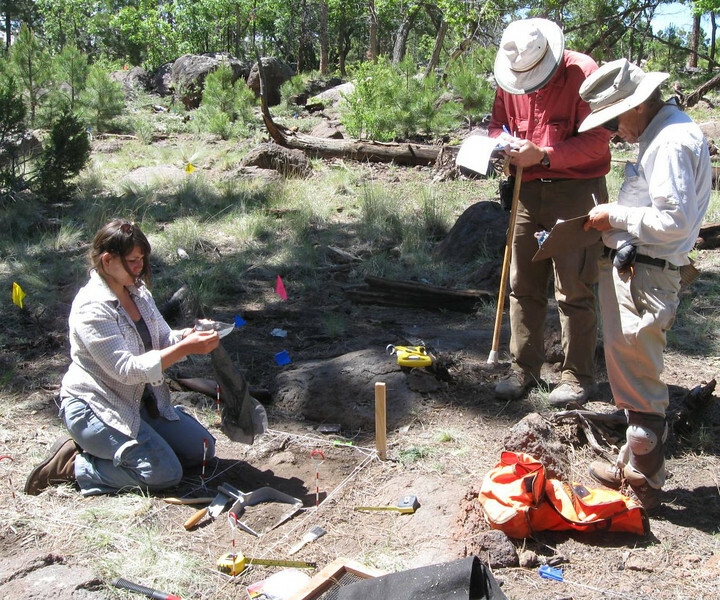 Bob Rushforth, Cristin Embree, and Linda Popelish set up an excavation grid at the site. 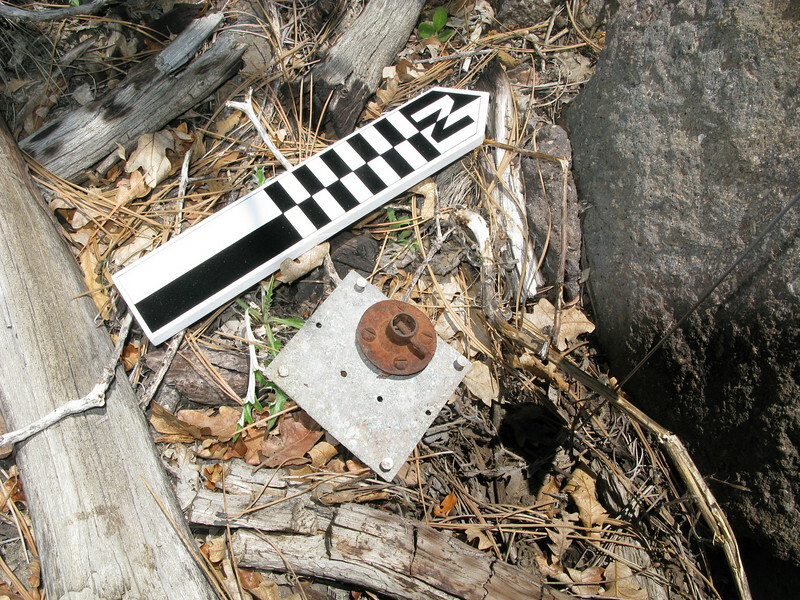 The excavation grids were one meter square and were placed at various locations at the crash site. 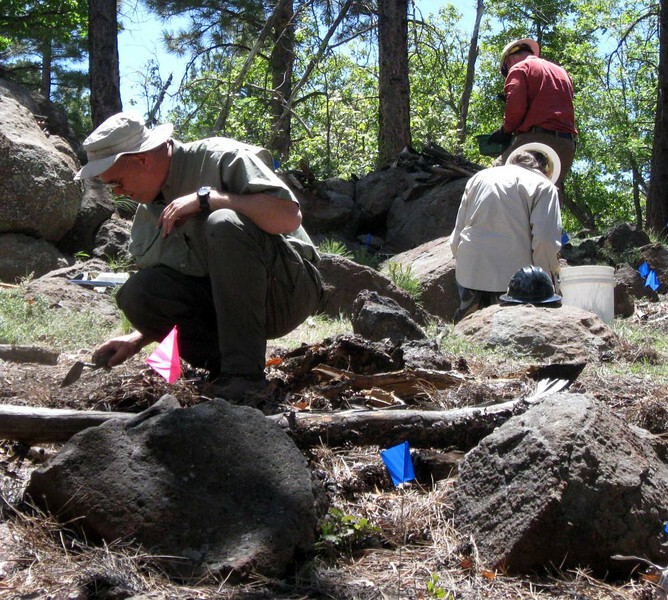 The goal was not to completely excavate the crash site, but to gain an understanding of the remaining sub-surface artifacts. 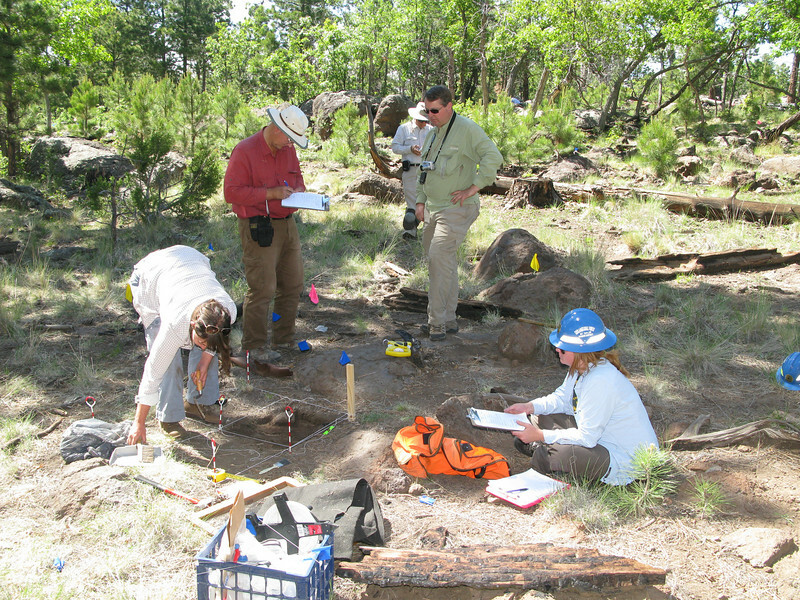 The information obtained by the excavations allow the USFS to better manage the site. 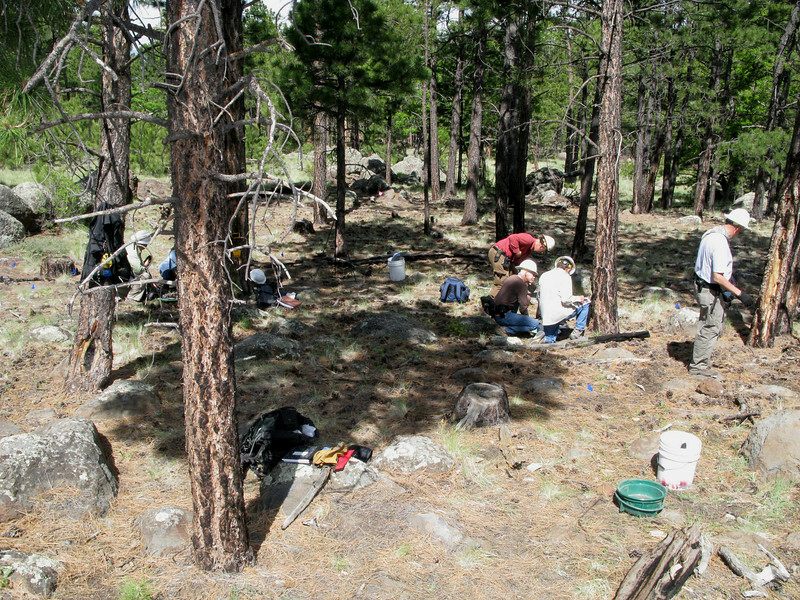 Setting up an excavation grid in the debris field. 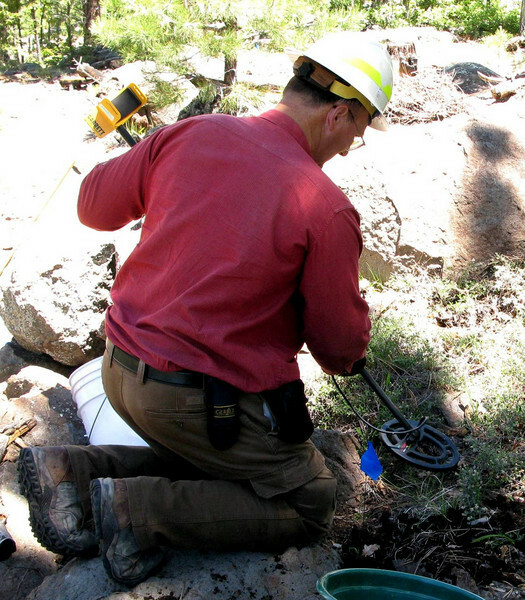 Matt Wehling conducts a final search for surface metal objects with a metal detector prior to setting up an excavation grid at the main impact site. A majority of the team began excavation work at the main impact site, or where the Tri-Motor fuselage finally came to rest. 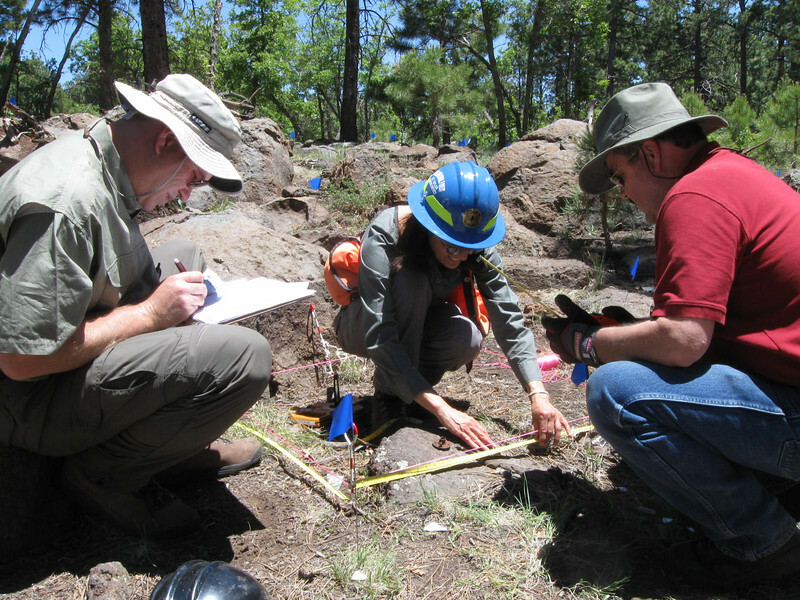 Mike McComb, Linda Popelish, and Brian Richardson begin the excavation work as surface features are mapped first prior to any digging. 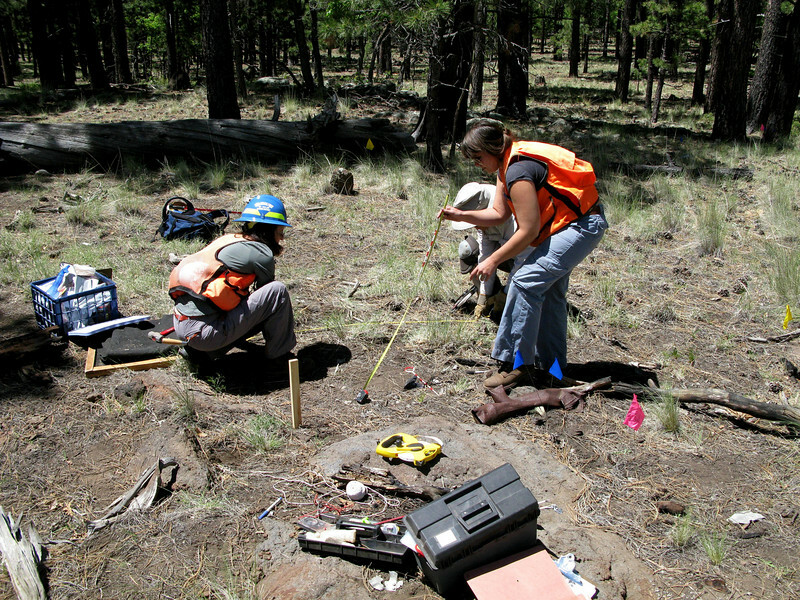 USFS Archaeologist Cristin Embree recovering a buried piece of wreckage as Matt Wheling and Bob Rushforth record the find. 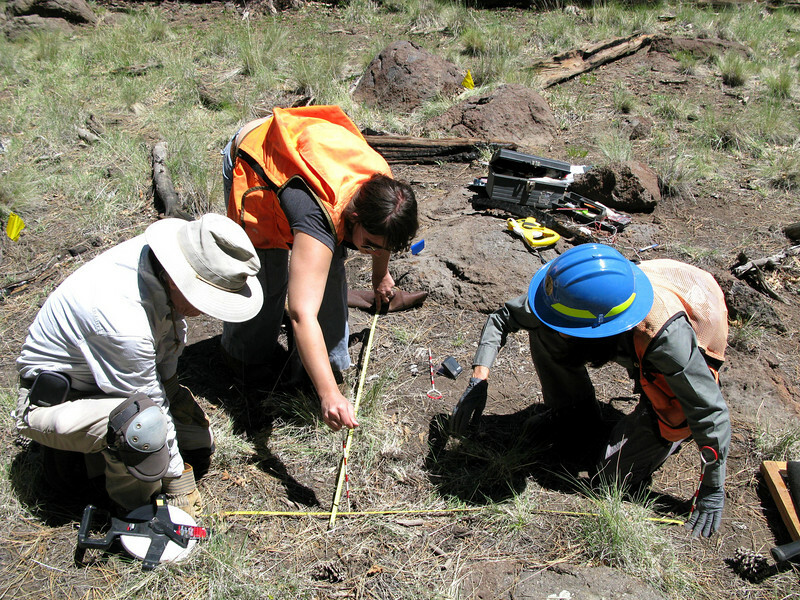 USFS Project Leader Linda Popelish recording a recovered piece of aircraft wreckage from an excavation grid. 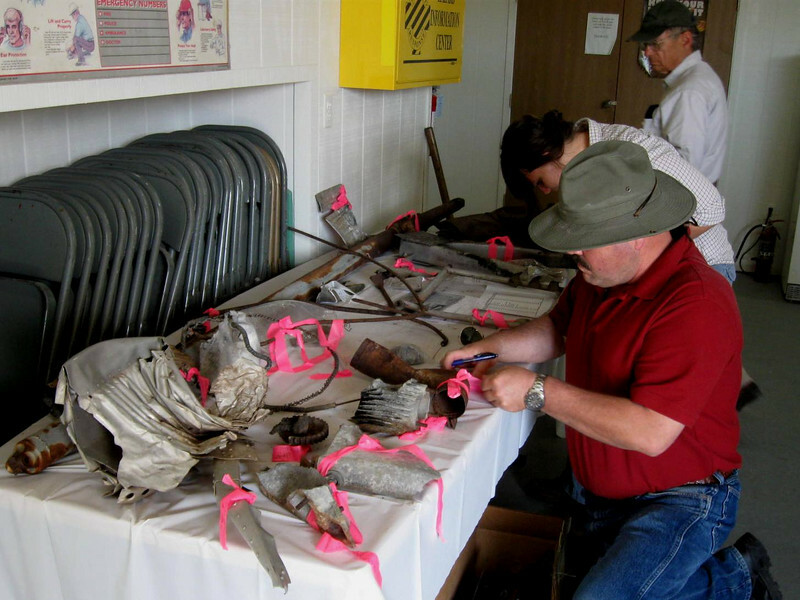 Soil was screened into the five gallon buckets and the recovered artifacts separated into the zip-lock bags. 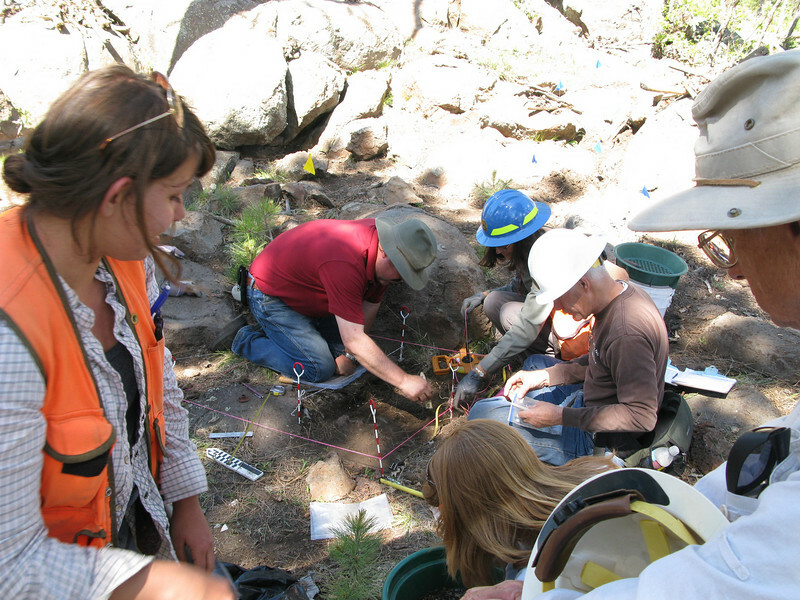 The excavation work went slow, but was very methodical in it's practice. 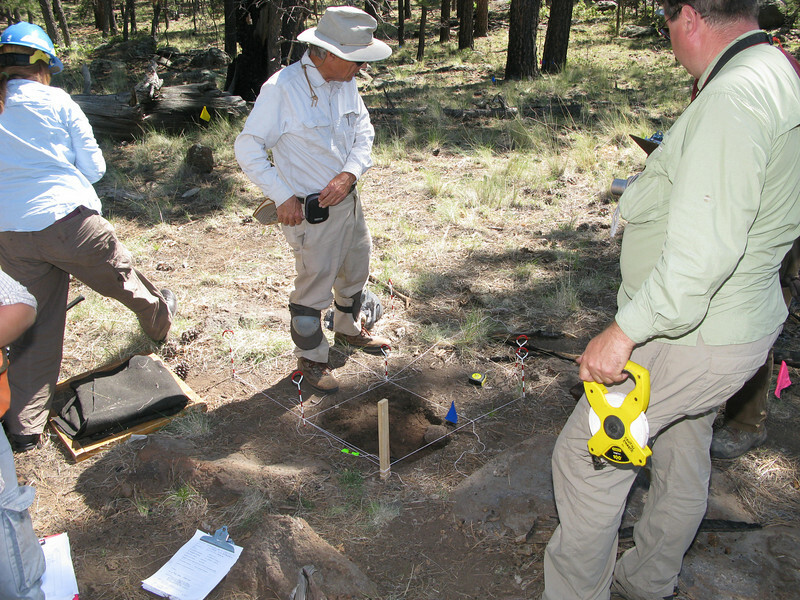 The excavation grids were divided into separate quads to help in the mapping of sub-surface artifacts. 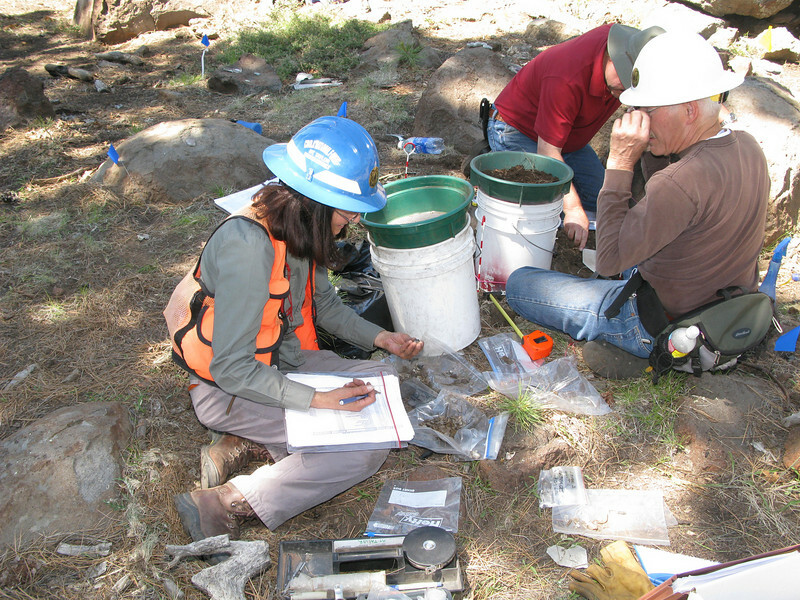 The excavation of the main impact site revealed the largest variety of artifacts recovered such as; airline dishware, glass, and small jewelry beads. 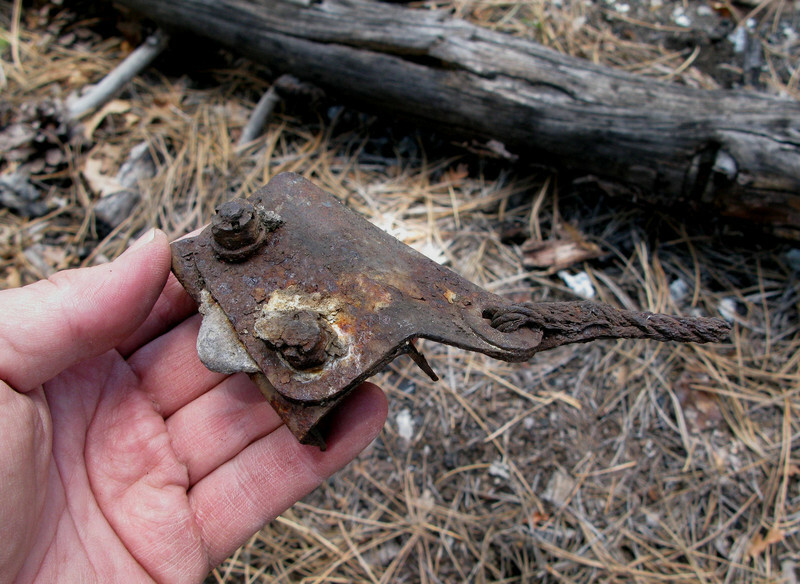 Over a period of many years, a collection of recovered wreckage from the "City of San Francisco" has been maintained by the USFS District Office in Grants. 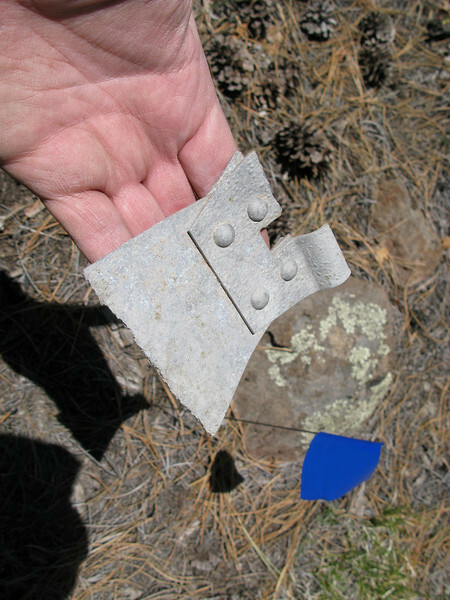 Some fragments were brought in and donated by local residents. The collection of fragments were removed from storage and displayed during the project with the hope that many of them could be identified by our team. 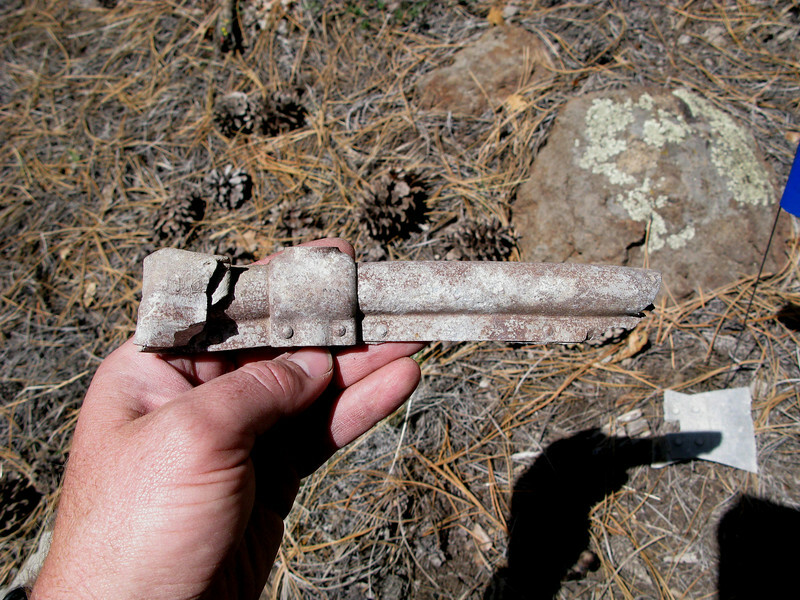 This Pyrene fire extinguisher handle and pump assembly was recovered from the crash site of the "City of San Francisco" by a local resident. It is currently on display at the USFS District Office in Grants. 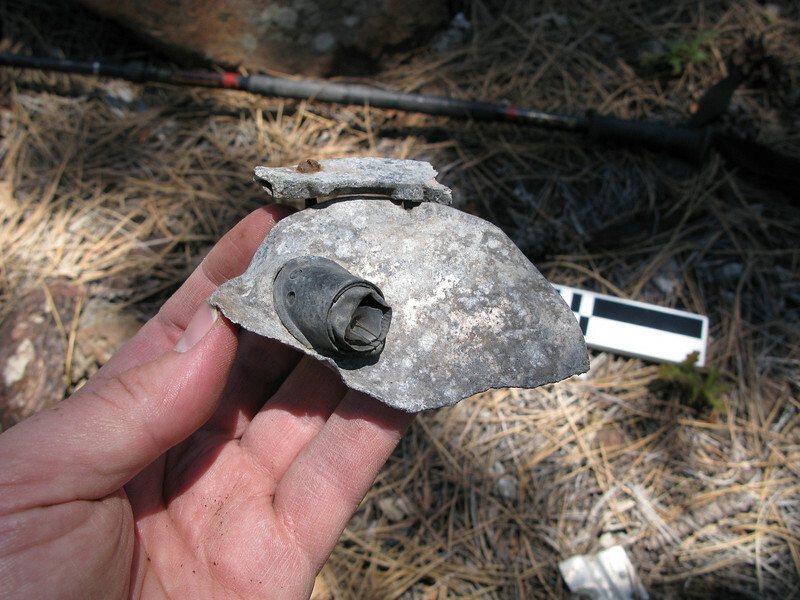 An example of an undamaged Pyrene fire extinguisher. 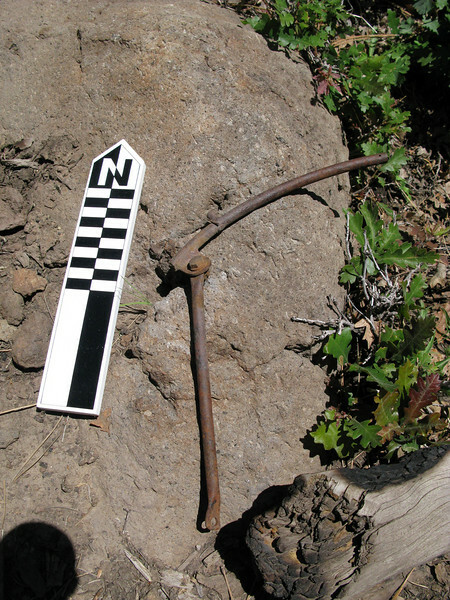 The components circled match the recovered artifact above. These fire extinguishers were generally mounted to the interior walls of the Tri-Motor's passenger cabin. Out of the 199 Ford Tri-Motor aircraft built, very few exist today. 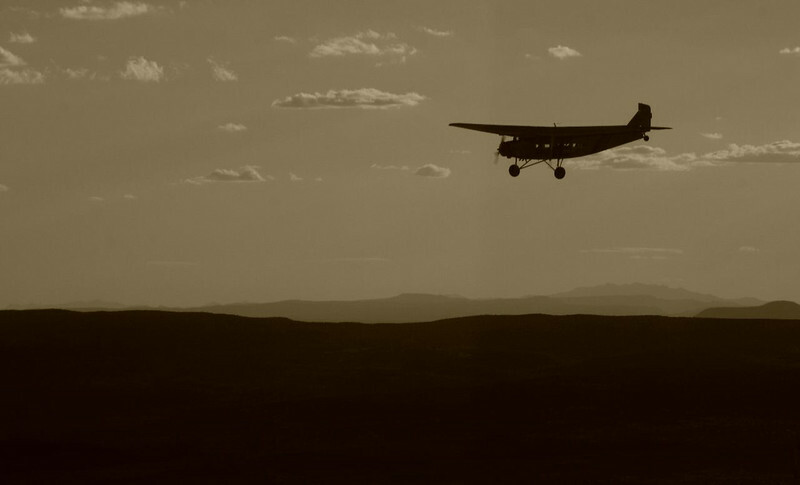 Even fewer are in flyable airworthy condition. 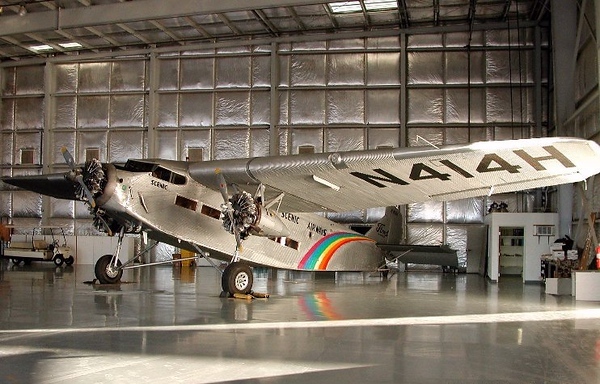 N414H, built in 1929, is not only in flyable condition, but is also a Model 5-AT. The same model aircraft as the "City of San Francisco". 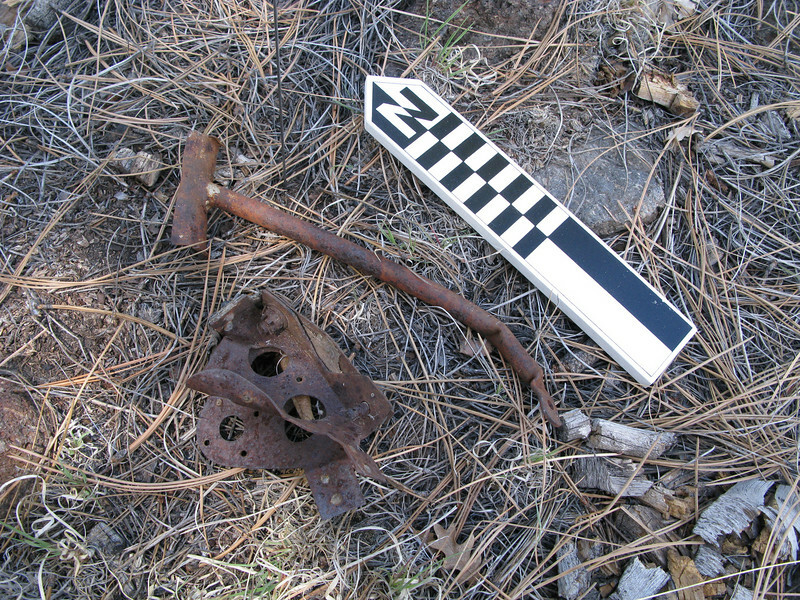 Many of the recovered and documented fragments from the crash site were able to be matched to structure and components from this aircraft. 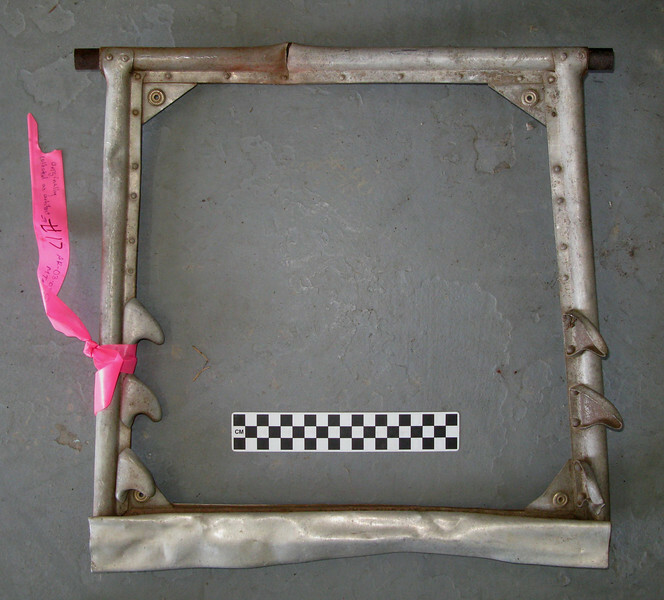 Located at the crash site was a fuel tank support strap buckle used to secure one of the three fuel tanks on the aircraft. This photo of a fuel tank support strap and buckle in Tri-Motor N414H illustrates it's use and placement within the wing of the aircraft. 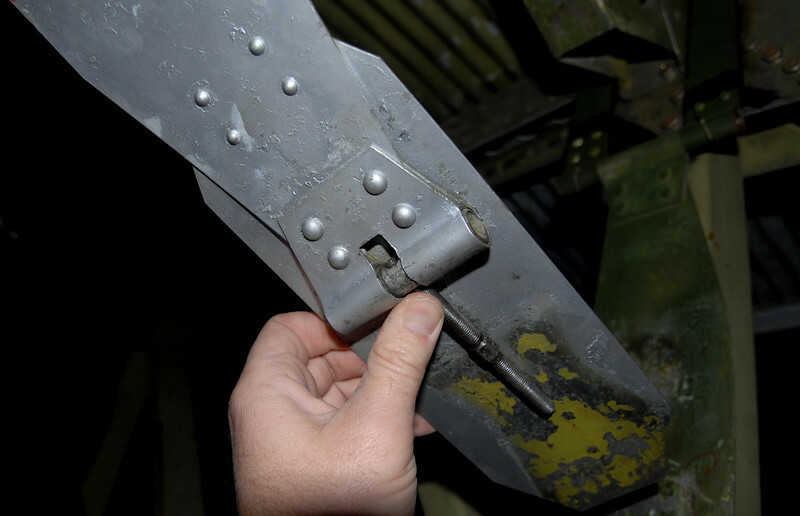 A structural stringer riveted brace was unique in it's design to the Ford Tri-Motor. 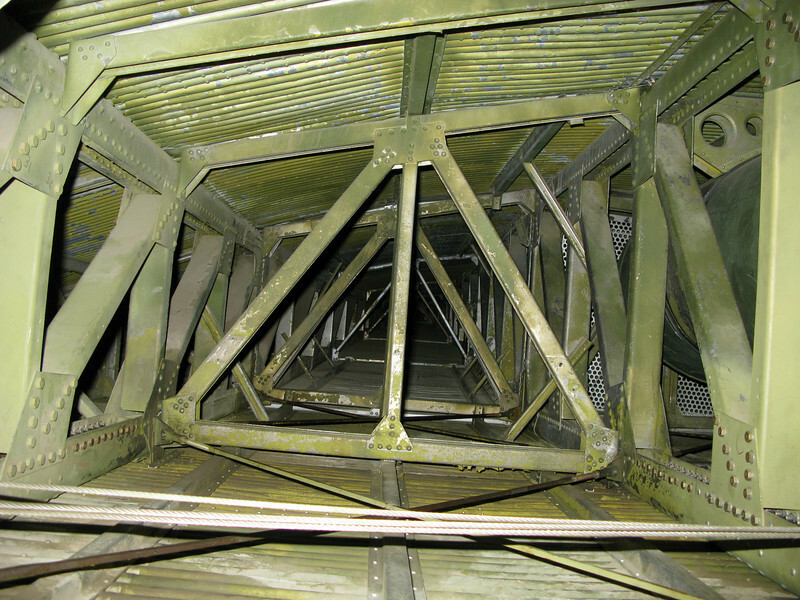 A view inside the wing box of N414H depicting the structural stringer supports. Square tubing, support braces, and lots of rivets give amazing support to the internal structure of the Ford Tri-Motor wing assembly. 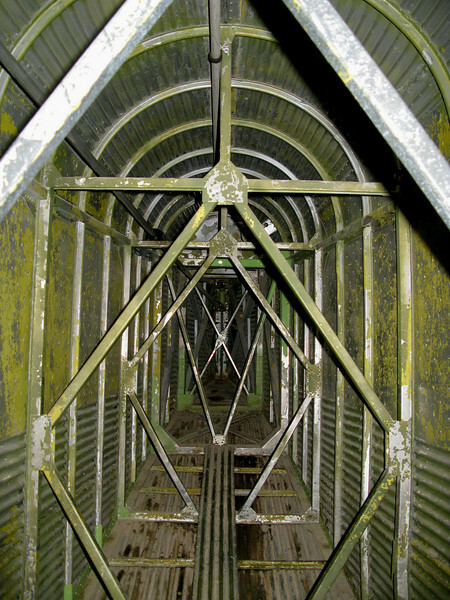 A view looking back into the structure of the aft fuselage of the Ford Tri-Motor. 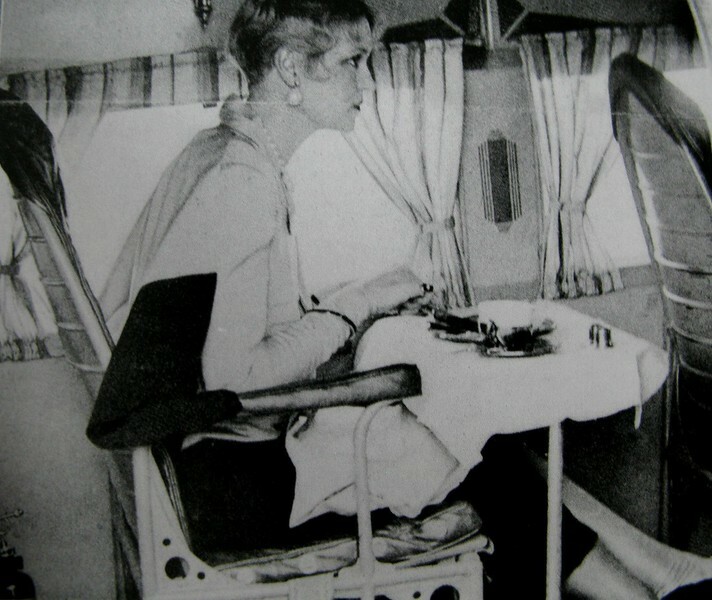 A vintage TAT airline promotional photo showing a passenger seated for meal service in the Ford Tri-Motor. 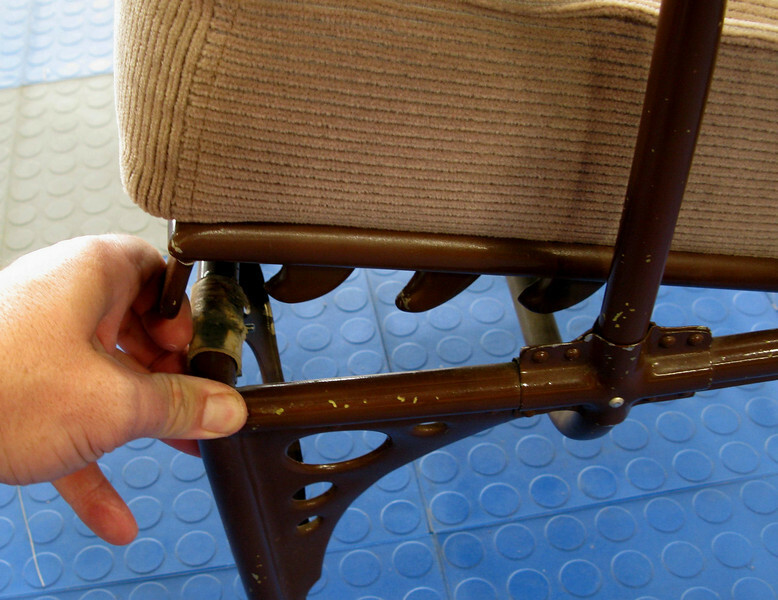 This original Ford Tri-Motor passenger seat is not a museum display, but is actually used in Tri-Motor N414H. One of few of these aircraft remaining that's certified airworthy to carry passengers. A passenger seat pan frame. 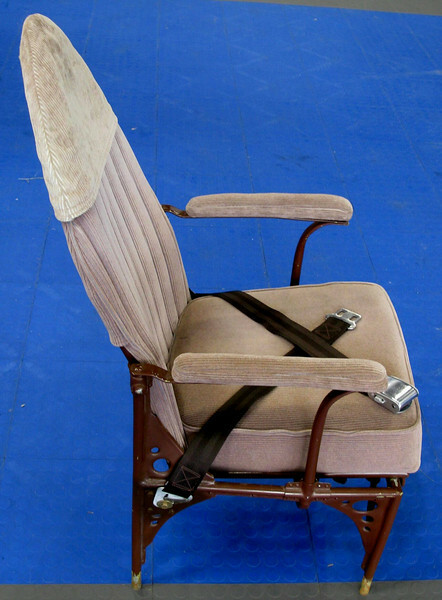 The six stamped metal "shark fins" allowed support to recline the seat back. This photo illustrates how the "shark fins" were mounted on the base of the passenger seat cushion. 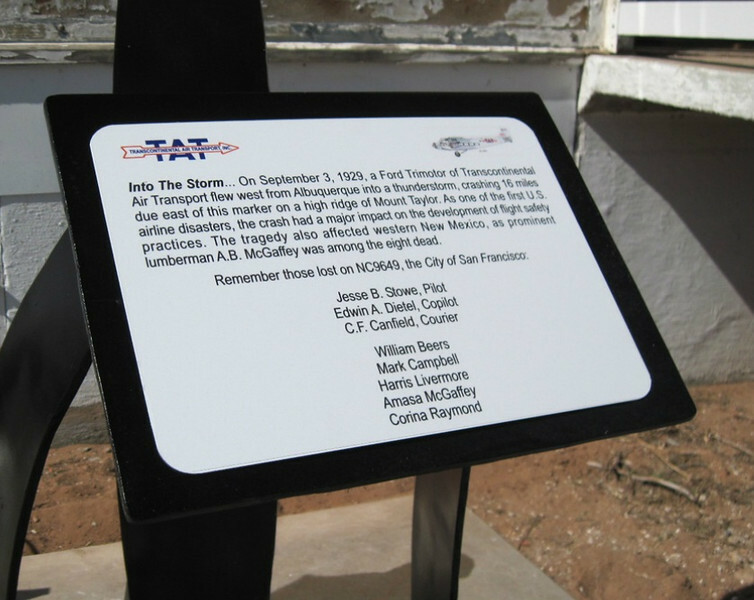 On September 28, 2012, the Cibola County Historical Society unveiled a memorial plaque dedicated to those persons lost on the "City of San Francisco". Like the famous maritime disaster of the Titanic, the air disaster involving the "City of San Francisco" on September 3, 1929 set the early standards of transportation safety.